Finally a bit of time to post after more than a week. Been busy with work and travelling I hardly have time to play with my pliers and wires these two months of 2011. This bracelet was completed before Valentine's. It's a quick project as I only need to insert the tourmaline into two wires of same length, bend them slightly, form the loops on both ends of the wire. To add a bit more colors and character to it, I added two oval shaped beads - agate (I think) and moonstone. Hold both tourmaline wires with jump rings and connect them to the chain on one end and to the oval shaped agate on the other. I am sharing with you a creation by Martin. Martin made this Twice Around the World (TAW) Bracelet based on my tutorial. Martin says "Hardest part seems to be aligning the prongs and getting accurate close fit". So, that's for you to consider before embarking on this project. By the way, the stones are Blue Lace Agate and love the heart shaped t-bar fastening. Ok, before I end this post, I hope the 25% off for this tutorial is still on. 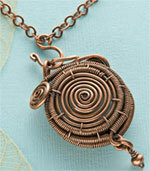 I got this Spiral-Locket Tutorial by Mary Tucker at Interweave Store for $3.00! Been wanting to get this tutorial as I can't get the magazine here. So happy! If you are interested, check out Mary's Spiral Locket here. Happy creating. For me, this is one more project in the to do list. Love the bracelet Mei...what a nice Valentine's gift to you!!! I love your collection. Nice color combination. They all make this sulky day look shinier.They are pretty. but I prefer handcrafted items..